President Isaias Afwerki today received a letter from Indian Prime Minister Narendra Damodardas Modi inviting him to participate at the India-Africa Summit scheduled to take place from 26 to 29 October next month. 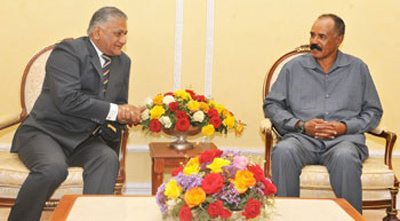 The formal letter of invitation was delivered to President Isaias today by Dr. V.K Singh, Minister of State for External Affairs and Overseas Indian Affairs. Minister Singh underlined that India was earnestly working to cultivate ties of cooperation and partnership with Africa. This was predicated in a proper appraisal of its potential on the one hand, and, the prospects and opportunities that Africa offers on the other. President Isaias Afwerki noted that Eritrea endorses the cultivation of warm India-Africa ties that are hinged on symmetric relationships and mutual respect. Within this framework, Eritrea is keen in fostering partnership with India in the sectors of human resources development, transport and communication services, as well as, agriculture and food processing. In the press statement to ERINA News, Dr. Singh emphasized that India is prepared to cooperate with Eritrea in various sectors. The Minister underlined that sustainable progress cannot be guaranteed without nurturing extensive web of ties of cooperation with partners. In this regard, the Summit is expected to create a vital platform for African countries to chart out plans of action that promote their development agendas. Eritrea is a former Italian and British colony. In 1952 the UN established it as an autonomous entity federated with Ethiopia. India formally recognized Eritrea soon after its independence in 1993. During 2014-15 India-Eritrea bilateral trade was around US$ 244.73 million. Exports from India include electrical and miscellaneous engineering equipment, drugs and pharmaceuticals, cotton yarn and fabrics. India is among the largest exporters to Eritrea along with Italy and the UAE. Eritrea imported millets worth US$ 200,000 from India during 2010. Eritrean exports to India consist mainly of leather, hides (excluding raw hides) and skins. Eritrea qualifies for India’s offer of unilateral duty free tariff preferential market access for export of goods and services to India. The scheme, introduced in 2008, offers duty free access to exports from LDCs on 84% of India’s tariff lines and preferential access for another 9%. India extended a Line of Credit of US$ 20 million (US$ 10 million each for education and agriculture projects) to Eritrea in July 2009. Shortly after Eritrea’s independence, India offered assistance in its legislative drafting process. Assistance in form of scholarships through the Indian Technical and Economic Cooperation (ITEC) programme has evolved. Over the years, India has offered capacity building assistance in several fields to Eritrea including in agriculture, medicine and education. A trilateral agreement between Eritrea, India and the FAO was signed in Rome in 1998 under which nearly 100 Indian agricultural experts were deputed to Eritrea to help increase agricultural productivity and production, inland fisheries and aquaculture. A Memorandum of Understanding on Cooperation in the field of agriculture between Eritrean authorities and the Indian Council for Agricultural Research was signed in 2006 during the visit of the Minister of Agriculture of Eritrea to India. In 2003 India donated 5,000 metric tonnes of wheat to Eritrea. Earlier, India had provided 1,500 metric tonnes of wheat and 200 metric tonnes of sugar to Eritrea as relief assistance. Government of India’s Pan-African e-network project for Eritrea was inaugurated in August 2010. All three sites (VVIP node, medical and education) are functional. Two screenings of special lectures under the Pan African E-Network project have been done at the Orotta National Referral Hospital in Asmara in May and July 2012. At the request of the Eritrean Government, India provided a legal expert, under the ITEC scheme, to Eritrea for two years. Fifteen ITEC scholarships were offered to Eritrea during 2009-10. Three other slots were utilized under India-Africa Forum Summit scholarship scheme (2010-2011). Pursuant to the 2nd Africa-India Forum Summit held in Addis Ababa in May 2011, the ITEC training slot availability during 2011-12 was enhanced to 35. During 2011-12, Eritrea utilized a total of six slots – two each offered under the ITEC, IAFS and C. V. Raman scholarships. One Eritrean official attended the 52nd Professional Course for Foreign Diplomats (PCFD) during August-September 2011. Eritrea availed of the one slot offered under the Indian Council for Cultural Relations (ICCR) scholarship programme. 30 ITEC slots and 8 ICCR slots have been offered to Eritrea during 2014-15. Eritrean officials attended the Conference on Government of India Lines of Credit held in New Delhi on November 22-23 2011. One Eritrean official visited India to participate at the 4th International Civil Aviation Negotiations Conference (IndiaICAN) held in Mumbai during October 17-22 2011. Delhi, Delhi University and Hamdard University. An agreement was concluded for cooperation with IGNOU. A 3 member expert technical team from MEA & HMT(I), India visited Asmara in October, 2014 and finalised the detailed project report and project parameters for setting up of a Vocational Training Centre which is expected to be installed in 2015.